Performing the whole electrical installation process requires you to obtain adequate understanding about all the rules and regulations that govern it. It requires familiarity on the basics of calculating total power demand from data that are relative to power and location for each load. Effective electrical installation also requires the installer to gain more knowledge about the different operating modes including starting conditions, steady state demand and non-simultaneous operations as all these play a major role in ensuring that you get the best results out of the task. Knowledge about all these operating modes is also a huge help in obtaining the required power from the appropriate source of supply as well as the number of necessary sources for adequate supply. Installing electrical wirings and equipment also requires you to become familiar about tariff structures as this will allow you to obtain the best arrangement for connection to the network for power supply such as low and medium voltage level. It should be noted that the entire network for electrical installation distribution is actually studied as a whole system. It is also important for you to note that neutral arrangements for earthing are primarily chosen based on local constraints and regulations that relate to the kind of loads used and the power supply. You will also need distribution equipment for the installation process. These include switchgears, panel boards and circuit connections. It is important for you to remember that the electrical installation distribution equipment that you will use will depend on your building plan, load grouping and location. 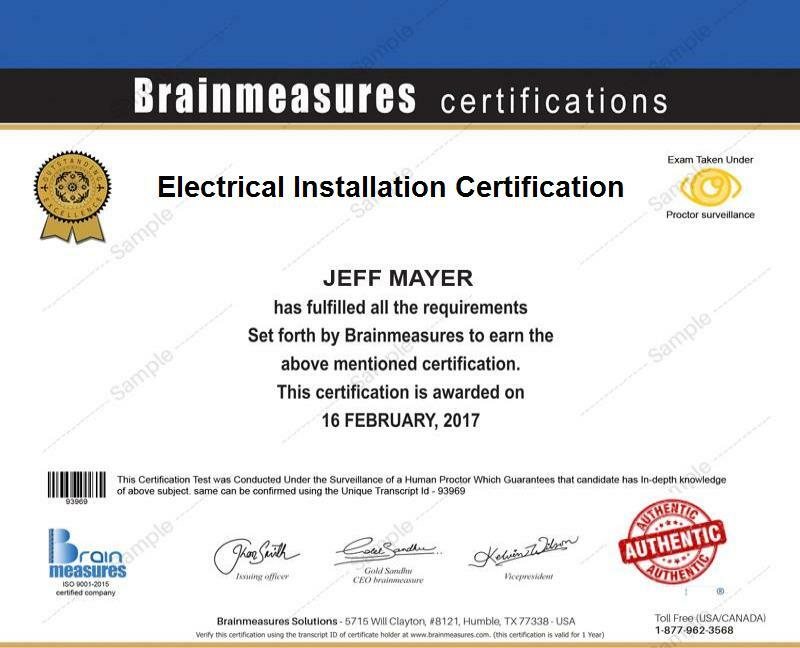 Enrolling in the electrical installation certification course offered by Brainmeasures is the best thing that you can do especially if you have longed to master the whole electrical installation process. Brainmeasures has been around for quite some time now and it received excellent reputation and great reviews for all the online certification courses that it offers. This can give you a hundred percent guarantee that its electrical installation course is also capable of giving you nothing but the best. Enrolling in this certification course gives you the chance to access a well-detailed electrical installation training which covers everything about the electrical installation process including the steps involved in performing it, determining the service connection that you need, different sources of power and the many things that you can do to protect yourself against harm such as electric shocks and over-voltages when performing the whole installation process. Once you complete this popular certification course, you will be able to receive your electrical installation certificate which is a strong indication of your skills and expertise in this specific field. How to safely and effectively work in an electrotechnical environment? How to effectively alternate electrical machines and current theory? How to effectively perform the electrical installation process in buildings and structures? The electrical installation certification program which is now easily accessible at Brainmeasures caters to the needs of a wide range of individuals and professionals that work in the electronics and electrotechnical industry. You may find this certification course suitable for all aspiring and existing technicians, engineers, supervisors, test technicians, operators, electricians, field service engineers and any other electrical personnel. Your successful completion of an electrical installation certification course is extremely rewarding because it allows you to enjoy an even higher pay. With the help of your electrical installation certification, you will find it easier to work as an electrical installation specialist which allows you to earn an average of $61,000 per year. You also get the chance to work as an electrical installation design engineer which gives you the chance to enjoy an annual pay of around $51,000 to $102,000.